CHANCE FOR A SPINSTER. -- A young man in Aroostook County, Maine, advertising for a wife, speaks of himself as follows: "I am eighteen years old, have a good set of teeth, and believe in Andy Johnson, the star-spangled banner, and the 4th of July. I have taken up a State lot, cleared up eighteen acres last year, and seeded ten of it down. My buckwheat looks first-rate, and the oats and potatoes are bully. I have got nine sheep, a two-year-old bull, and two heifers, besides a house and barn. I want to get married. I want to buy bread-and-butter, hoop-skirts, and waterfalls for some person of the female persuasion during life. That's what's the matter with me. But I don't know how to do it." I requested more information from the tweeter, but we'll see what happens. (I am not very hopeful of a response; with over 200 replies, I doubt mine will garner any special attention.) Google Image search was not very helpful. Was this a real newspaper ad that ran in 1865? If the ad did run, is there any indication whether there actually was an eighteen-year-old man seeking a wife behind them (as the pictured article claims), or was this just a joke? As Samuel said, the particular version shown in the OP is from 02 September 1865 Harpers. However, the story had been circulating and distorting for at least a month by this time. So in the earlier version of the story, the man was answering an advertisement, not himself advertising. So someone would need to find that issue of Portland Eastern Argus to better answer. The 'ad' is obviously a joke. "Humors of the Day" is to Harper's Weekly what "Laughter is the Best Medicine" is to Reader's Digest. To be absolutely sure, just look up from the ad on this page from that issue of Harper's Weekly. Not long ago the rector of the parish in ---shire was surprised by a request from an old woman in his village, that he would give her a seat in the church quite close to the pulpit. "Why, Molly," said he, "you're not deaf; surely you can hear my sermons quite well from where you now sit." 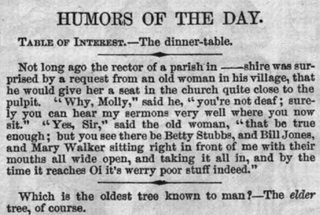 "Yes sir," said the old woman, "that be true enough; but you see there be Betty Stubbs, and Bill Jones, and Mary Walker sitting right in front of me with their mouths all wide open, and taking it all in, and by the time it reaches Oi [Of?] it's werry poor stuff indeed. Granted, the joke has not aged particularly well (nor has the rest of the column), but it obviously is not meant to be taken seriously. It was intended as a joke, which also explains why it changed upon retelling as mentioned in DavePhD's answer. So I put the words into Google search, and I found that it's from Harper's Weekly, Volume IX, Issue 453, Page 551, in the section called "Humors of the Day." You can see an image of the page here (on the bottom right corner, right next to the picture). I assume that it's real if Harper's printed it; I don't think there's any reason to assume it was just a joke. Not the answer you're looking for? Browse other questions tagged united-states marriage . Is it a felony in Montana for a wife to open her husband's mail? Is there scientific justification for the Hindu gotra system?